The heart is a playful, symmetrical shape with universal meaning as a symbol of romantic love. Diamonds symbolize the same thing, so it's no surprise that heart shaped diamonds are such a popular Valentine's Day gift. Throughout the past decade, heart shaped engagement rings have also become a bonafide trends among brides who want something original, feminine, and brilliant on their fingers. 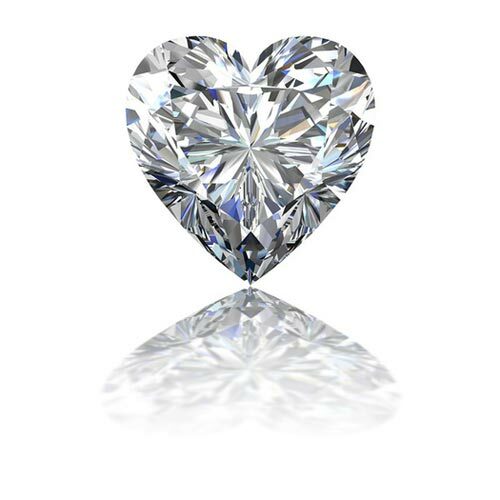 However, the origin of the heart shaped diamond is much older than that. In the 16th century, Queen Elizabeth received a ring with a heart shaped diamond from Mary Queen of Scots. More than four centuries later, on Valentine's Day 2015, pop star Lady Gaga announced her engagement by debuting a heart shaped engagement ring on Instagram. As fashion trends and traditions have evolved, the heart shaped diamond clearly never lost its appeal. The diamond still represents status and commitment, but the heart shape elevates the diamond ring to a sweeter, more sentimental piece of jewelry, and these famous examples add a sense of luxury and exclusivity that shoppers notice. The heart shape is obviously loaded with sentimental value, but it's particularly appealing because of its pleasing vertical symmetry and brilliant, pointed end. Unlike most traditional diamond shapes, including round, emerald, oval, and radiant, the heart isn't perfectly symmetrical. Instead, it's a wider version of the pear shape, with a tiny chunk chiseled out of the top. This dip allows for more facets and makes the heart shape one of the most brilliant options. Heart shaped diamonds are distinctive because of this asymmetrical design, and they're also more versatile. Different length-to-width ratios allow shoppers to choose the outline of their pendants and rings. Longer diamonds flatter shorter fingers, while shorter, wider diamonds are better options for longer fingers. This makes the heart shape particularly easy to customize for each individual owner. Contact Inter-Continental Jewelers today for the top Houston diamond jewelry at the best prices. We can find you quality heart shaped diamonds within your budget among all other diamond shapes.